The vivid growth of industrial hydrogen applications across sectors such as chemical processing, fuel cells, refinery, and petroleum is soon going to result in hydrogen generator turning into a billion-dollar market. 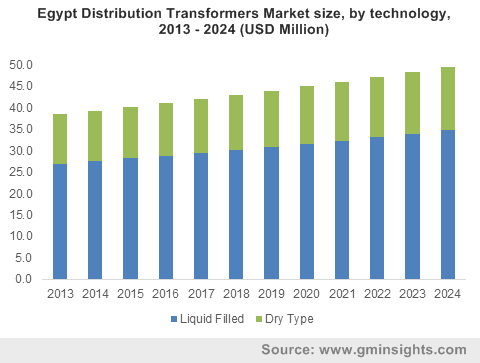 According to Global Market Insights, Inc., “The Hydrogen Generator market worth USD 800 million in 2015, is estimated to surpass a revenue of USD 1.32 billion by 2024.” Hydrogen generators are primarily the units installed to produce hydrogen. Depending on the requirements of the industrial process, the hydrogen generator deployment is mainly done either as an onsite generator or a portable generator. The expanding automotive industry will bring enormous growth prospects for the overall market. Increasing adoption of electric vehicles is encouraging the growth of hydrogen fuel stations in turn stimulating the market growth. The government is also encouraging the use of electric vehicles over the conventional means of transport owing to the eco-friendliness, reduced fossil fuel dependency, and operational cost-effectiveness of the former. Key automobile manufacturers such as Ford Motors, Nissan, GM, Mercedes-Benz, Honda, Toyota, and Tesla Motors are also significantly sharing the electric vehicle business space. It is estimated that the global electric vehicle sale will surpass 7 million units by 2024. This will in turn result in a comprehensive increase in the fuel cell demand. 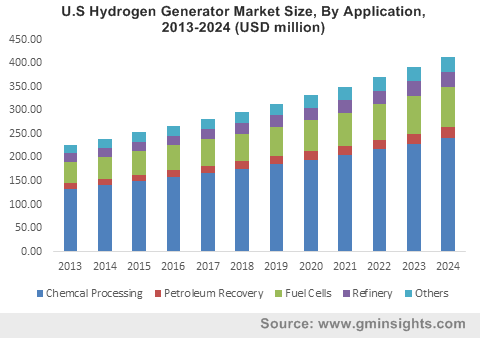 Hydrogen generator application in the fuel cell market is anticipated to grow at a CAGR of 6% over the period of 2016-2024. The refinery industry is another major growth prospect for the hydrogen generator market. It is estimated that the hydrogen consumption in refineries accounts for 12 billion standard cubic feet per day. The demand for hydrogen in the processing of crude oil into refined fuel such as gasoline and diesel and removing the impurities from these fuels are expected to catalyze the application growth. Hydrogen generator application in refineries is forecast to surpass USD 120 million by 2024. The food and beverage industry is also supporting the hydrogen demand owing to its application in removing contaminants such as bacteria and viruses from the food items. “Global hydrogen generator market is anticipated to grow at a CAGR of 5% over the period of 2016-2024.” North America market accounted for USD 300 million in 2015, and is estimated to witness substantial gains over the coming period. The growth can be attributed to the rising demand across power generating plants & refueling stations and growing trend of green fuel across this region. The U.S. and Canada will be the major revenue pockets for the North America hydrogen generator market. This entry was posted in ENERGY, MINING, OIL AND GAS and tagged Application Potential, Competitive Market Share & Forecast, Hydrogen Generator Market Size By Product, Industry Analysis Report, Price Trends, Regional Outlook. The solar power sector in U.S. deployed 2,052 megawatts of photovoltaic in the second quarter of 2016 bringing total power capacity of the country to about 32 gigawatts. This much of power generation made possible due to the installation of solar panels in the country has the ability to supply electricity to greater than 6.3 million U.S. homes. Generation of power through photovoltaic or solar panels will also help in reduction of greenhouse emissions by about 39 million metric tons in a year. A new solar panel was installed per 84 seconds in first six months of 2016 and it totaled about 1004 installations per day. This installation rate is projected to take the current total of 1.2 million solar panel installations to about 2.2 million solar panel installations by end of 2018. U.S. solar power industry is anticipated to add about 14 gigawatts of new power capacity in 2016, which is more than double as compared to the total power capacity of the industry for 2015. As per the Global Market Insights report, U.S. Solar Panel Market is projected to experience substantial expansion from 2016 to 2023. By end of 2021, the U.S. solar power sector is anticipated to expand and this will generate more job opportunities and investments in the country. All these factors are predicted to boost the demand for solar panels and will boost the U.S. solar power industry growth. Global Market Insights report states that global solar energy market size is projected to surpass $141 billion by end of 2023. This entry was posted in ENERGY, ENERGY, MINING, OIL AND GAS and tagged Application Development Potential, Competitive Market Share & Forecast, Industry Analysis Report, Price Trend, Regional Outlook, Solar Energy Market Size. As per the ARENA (Australian renewable energy agency), construction of twelve new solar power plants in Australia is predicted to treble country’s extensive solar energy output. The agency declared that it will make total investments of $92.1 million in construction of these 12 plants. It includes six plants in Queensland, five plants in South Wales and one plant in West Australia.ARENA stated that they would improve country’s total solar capacity from 241 megawatts to 721 megawatts, providing enough power supply to about 151,000 Australian houses on an average. It declared that these solar power plants projects were predicted to generate $1.1 billion of commercial investments and propel economic growth of the region. Biggest solar power plant is expected to be constructed at Darling Downs in Queensland and is projected to produce about 111 megawatts of solar power. It will help in reducing environmental pollution and act on climatic changes and will generate new employment opportunities along with diversification of economy of Queensland. This largest renewable energy plant of Australia constructed at Queensland will create higher than 501 direct jobs along with hundreds of indirect employments. It will produce enough renewable energy to meet the power requirements of 120,000 houses in Queensland. Four of the five solar power plants projects in this region has received state government’s long term financial assistance. It is expected that the construction of all these plants will be completed by end of 2017. Kidston renewable power hub is being developed in northwest of Townsville in Australia. It comprises of a big solar farm and is integrated with pump storage hydro project. The main reason being low price and efficiency of pump storage hydro battery which has capacity to store solar energy. As per global market insights reports, global solar energy industry size is predicted to expand at more than $141 billion by end of 2023. Thus Australia solar power production is projected to contribute heavily towards demand and growth of this global industry. Construction of solar power plants will also help to reduce carbon emissions in atmosphere and will help to curb the impact of global warming. It will also help in maintaining natural equilibrium & nitrogen cycle, retaining ecological balance and regulating seasonal cycles. This will boost the demand and growth of Australia solar energy market. This entry was posted in ENERGY, ENERGY, MINING, OIL AND GAS and tagged Application Potential, Australia Solar Photovoltaic (PV) Market Size, Competitive Landscape & Forecast, Industry Analysis Report, Price Trend, Regional Outlook, Solar Energy Market Size. Global Butane Market size is predicted to surpass 266 million tons with projected gains higher than 2.8%. Rising LPG (liquefied petroleum gas) demand due to its acceptance as domestic fuel, specifically in APAC and Africa, is projected to promote global industry trends. Governments all across the globe are encouraging its usage to reduce greenhouse emissions and coal dependency. They are providing subsidy on LPG to promote its usage as domestic fuel. 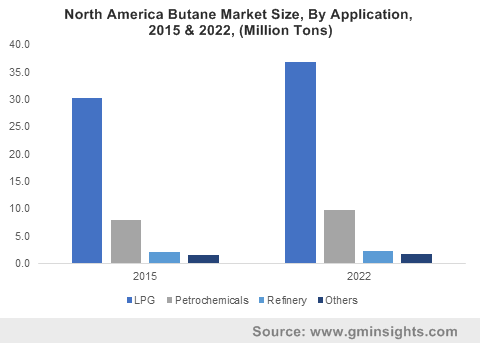 Butane market price trend is projected to soften during forecast timeline due to crude oil movement. Rising use of auto gas due to operational cost advantages as compared to oil based fuels like gasoline is projected to promote industry demand. It possesses high energy ingredients and burns easily as compared to other fuels. Use of auto gas as fuel is growing rapidly during past few years owing to ecological advantages. However, pollution of underground water due to leakage of methyl tert-butyl ether along with growing demand for ethanol as a replacement for gasoline is anticipated to hinder growth of global butane market in future. Global butane market is segmented into various applications like LPG, refinery and petrochemicals. LPG segment was biggest and contributed higher than $121 billion for 2014. Rising demand for heating fuel in cold locations along with use of fuel for cooking purposes in APAC is anticipated to promote demand of butane for LPG production. Furthermore, most of the Asian and European nations have been accepting LPG as transportation fuel. Petrochemical segment contributed higher than 16.1% of total demand and is projected to expand substantially during forecast timeline. Growth of the segment in middle east is projected to promote the demand during forecast timeframe. Global butane industry is segmented into geographical locations like North America, MENA, Latin America, APAC and Europe. APAC, led by India and China butane market, contributed key industry share and produced revenue about $57.1 billion for 2014. Increase in population and growing requirement for energy, specifically in rural areas of China and India for cooking is projected to stimulate the demand for butane. MENA (Middle East and North Africa) market share contributed more than 18.1 % of total size for 2014. Rising use of LPG as feedstock in replacing for natural gas & crude oil in factories and chemical sectors has enhanced the product demand in the region. This region is projected to experience exceptional growth owing to growth in countries like Nigeria, Saudi Arabia, UAE and Qatar. Key industry participants profiled in the report include British Petroleum, ExxonMobil Corporation, Valero Energy Corporation, Royal Dutch Shell, Tyumen Oil Company, Perenco, Total S.A, Air Liquide, Energy Corporation of America, Chevron Corporation, ConocoPhillips Company, Sinopec Group and China National Petroleum Corporation. This entry was posted in ENERGY, ENERGY, MINING, OIL AND GAS and tagged Application Potential, Butane Market Size By Application, Competitive Market Share & Forecast, Industry Analysis Report, Price Trends, Regional Outlook. 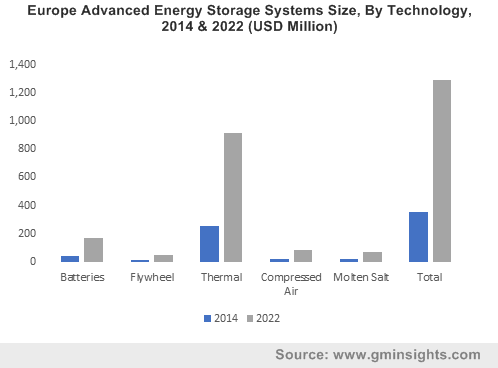 Global Advanced Energy Storage Systems Market size is projected to surpass 11.36 Giga Watts by end of 2022 and predicted to register CAGR of more than 15.1% during forecast timeline. Increasing concerns over power conservation and change in focus towards renewable energy sources is predicted to promote industry growth. Constant efforts by firms like Halotechnics, GE Renewable Energy and General Compression to introduce changes in the technology is predicted to promote the demand for the advanced energy storage systems in future. Strict ecological regulations implemented by U.S. Environmental Protection Agency and Department of Energy to reduce carbon emissions are predicted to fuel demand for these advanced power storage systems. However, heavy initial investment costs of installing the systems and large space requirement for system deployment are predicted to hinder advanced energy storage systems industry expansion all across the globe. But research and innovations in storage technology leading to production of low priced storage systems are predicted to generate new opportunities for firms to enhance their profits. This is predicted to enhance the global advanced energy storage systems market share. Global advanced energy storage systems industry is segmented into electricity production application, electricity delivery & management application and transportation application. Electricity production application segment was biggest and contributed more than 33.1% to the overall advanced energy storage systems market share for 2014. Transportation segment was second biggest application segment for 2014 and it generated a total revenue of more than $371 billion for this year. Electricity delivery & management segment is projected to experience biggest gains in future. Electric vehicles & batteries segment is considered as a perfect option for power storage during low demand and supplying power when there are peak loads. Application of smart electric vehicle charging stations is predicted to help customers supply power to grid. Plug-in electric vehicle is an established sub-segment of light duty vehicle segment and it contributed maximum revenue for period 2011 -2014. Global advanced energy storage systems industry is segmented into thermal technology, compressed air technology, batteries, flywheel technology and molten salt technology. Thermal technology was leading segment in terms of utility with value surpassing $1.32 billion for 2014. This technique has beneficial as compared to other techniques as it does not require any inputs like lithium nor it has any geographical constrictions. Factors like enhanced efficacy with low energy consumption and low greenhouse emissions are predicted to propel the use of this technology in many applications. Batteries segment contributed about 10% of total utilization share and is predicted to experience highest gains in future. Factors like charging ease as well as liquid electrolyte re-powering leading to low power wastage are predicted to favorably affect the segment demand. Flywheel technology segment is predicted to register CAGR of greater than 18.1% during forecast timeline. This technology has many industry growth avenues as it is more reliable, efficient, possess long life span and requires less maintenance. Global advanced energy storage systems market is segmented into geographical locations like North America, LATAM, APAC, Europe and MEA. North America led the global industry with U.S. advanced energy storage systems market contributing higher than 80.1% of global regional industry share. The nation is taking lot of pollution controlling measures and implementing many legislations in order to reduce the rate of pollution. European industry contributed more than 15.1% to the total demand for 2014 and is anticipated to experience substantial rate of growth during forecast timeline. Measures to enhance sale of electric vehicles in order to reduce pollution rate by countries like France and Germany are predicted to boost the regional industry demand. APAC advanced energy storage systems industry is predicted to experience biggest gains and predicted to register CAGR of more than 15.6% during forecast timeline. Countries like Indonesia, China and India are predicted to experience rise in construction activities. This aspect is predicted to enhance energy consumption resulting in greater demand for advanced energy storage systems for power conservation. Key industry participants profiled in the report include Furukawa Battery Company Limited, ZBB Energy, Hitachi, LG Chemicals Limited, Nippon Chemi-Con Corporation, Aquion Energy, A123 Systems LLC, Energizer Holdings Incorporation, Samsung SDI Corporation, GE Energy Storage, Alstom, SAFT, Altair Nanotechnologies Incorporation, Toshiba, China BAK Battery Incorporation, Energizer Holdings Incorporation, Enersys, Maxwell Technologies Incorporation, Exide Technologies, AES Energy, Greensmith, GE Energy Storage and Electrovaya Incorporation. This entry was posted in ENERGY, ENERGY, MINING, OIL AND GAS and tagged Application Potential, Competitive Market Share & Forecast, Industry Analysis Report, Regional Outlook. Small transformer segment is predicted to register CAGR of about 3.91% during forecast timeframe. Growing execution of the off load tap changer fitted equipment in outdoor and indoor applications can fuel segment demand. In addition to this, high cost efficacy provided for low density population network can further add to the demand during forecast timeline. This entry was posted in ENERGY, ENERGY, MINING, OIL AND GAS and tagged Application Potential, Applications, Competitive Market Share & Forecast, Forecast, Growth Trends, Middle East Distribution Transformer Market Size, Middle East Distribution Transformers Industry Size, Potential, Price, Price Trends, Share, Technology.